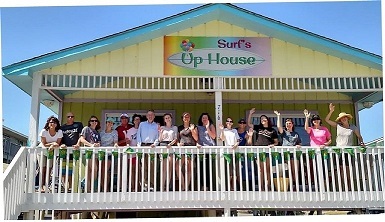 has Gulf Shores and Orange Beach Vacation Rentals Available! SLEEPS from 3 to 16 GUESTS! LAGOON FRONT WITH PIER AND BOAT LAUNCH! GULF FRONT TOP FLOOR UNIT! The home is 2000 sqft with 3 BR/2 BA in the main house and a 1 BR/1BA apartment attached. The main house has 2 King bedrooms and 1 Queen bedroom plus a queen sleeper sofa and sleeps 8. The attached apartment is 900 sqft and has a full kitchen, full bath, a large living area, one bedroom with two queens, two queen sleeper sofas in the den and also sleeps 8. The property sleeps up to 16 comfortably, perfect for multiple families or large groups. Fresh paint and brand new sleepers in both units. The large decks provide beautiful views of the Gulf of Mexico with access to the deck from the den, the Master, and the apartment entrance. Adjacent lot offers TONS of parking for all of your guests. Located just 1/2 mile down West Beach from Hwy 59 with restaurants, beaches, shopping, festivals, and groceries all within walking distance. Also, within blocks of this home is the Hangout, featuring nightly live entertainment, restaurants, canoe and kayak rentals, parasailing, Waterville Water Park, and more, more, more. If you like to FISH and set CRAB TRAPS this is the condo for you. 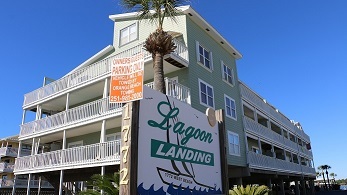 Enjoy the best of both worlds at Lagoon Landing. The condo sits on our beautiful 6 mile Little Lagoon, but the beach is just a few steps away. We have a boat ramp behind the condo on the lagoon side for those that enjoy boating, skiing, jet skis, sailing, kayaking, canoeing, and paddle boarding! . We have deeded beach access so you can walk right across the street to the beach anytime. Great family atmosphere and convenient to everything! The master bedroom has a king bed. You will enjoy a full private bath and balcony access from this bedroom. The guest bedroom has a queen bed with table and lamp on one side of the bed. Both bedrooms have flat screen TVs. The kitchen is fully furnished with new appliances. The bar seats 4 as well as the dining table. The living room has a pull out sofa, love seat and oversize chair. If you enjoy grilling, you will have access to several charcoal grills under a covered gazebo area next to the pool. There are also a couple of tables and porch swings in the area for "small get togethers"
There is a pier that goes out to a gazebo in the lagoon. For the people who like to fish, you will enjoy a large uncovered fishing platform on the other side of the gazebo. The covered area has a table and water access on one side for cleaning fish and crabs. There is also a porch swing on the other end that is wonderful to sit in and enjoy the sunsets. This luxurious 3 bedroom/3 bath beach front condo is a must see for your next beach vacation. Relax with a cocktail and enjoy the wonderful sunsets on our HUGE wrap around balcony that you can access from the dining area, the living room or the master bedroom. You and your guests will be amazed by the beautiful view from the 11th floor in Unit 1101 through the brand new windows and sliding glass doors! The MASTER SUITE features a KING SIZE pillow top. 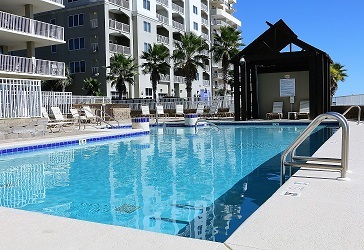 You can enjoy the BEAUTIFUL gulf view with 2 brand new sliding glass doors that face the gulf. This room also has a TV / VCR combo. The EXTRA LARGE master bath features a double vanity and over size tub/shower. Both the 2nd and 3rd bedrooms feature queen beds with side tables and lamps. Your guests will enjoy a private bath in the 2nd bedroom. The 3rd bedroom has a private access to the main bathroom. This room also features its own private balcony with sliding glass door. The FULLY EQUIPPED NEWLY REMODELED kitchen features granite counter tops. There are 4 seats at the bar and the glass top dining room table also seats 4. You will also enjoy the outdoor pool, indoor heated pool, sauna, hot tub and exercise room. There are convenient restrooms located by the indoor pool area. There are stainless steel charcoal grills located by the pool area with enough room to pull up chairs and have an outdoor BBQ.